Manufacturer of a wide range of products which include power magnet. We are a prominent manufacturer and supplier of Power Magnets that are fabricated using high coercive magnetic material. These power magnets are capable of separating the iron from arresting tramp iron and non-ferrous turning iron before it enters the machine and cause any damage to it. Moreover, these can be used to protect cattle feed pellet making machine and remove various iron impurities from slurry in ceramic industry. The flat side of this magnet has a hole that helps in fixing its position. Further, we can fix a handle in the hole to facilitate easy operation. 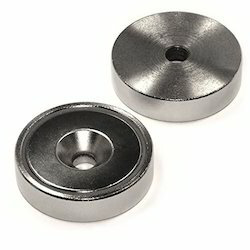 Looking for Power Magnet ?